I wanted to write and personally thank Wayne for the online- Arson Dog Training Program. I have always wanted to utilize an accelerant detection dog but because of responsibilities as a municipal fire chief, I could not take several weeks out of the office to attend a traditional handler training program. Your program has not only helped me acquire and handle an accelerant detection dog but also taught me how to select, imprint and train the proper dog to a competent level in order to pass rigorous certification testing conducted by a forensic chemist in accordance with NFPA 921( Guide for Fire and Explosion Investigations). After completing your program I was able to pass a team certification practical exam with the Canine Accelerant Detection Association (CADA). 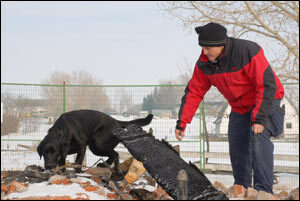 The oldest organization dedicated solely to Accelerant Detection Canines. To be honest, I was very skeptical at first that on-line program would really work. Not only did your program work for me, it was the best decision I made for obtaining my goal. The one on one class sessions conducted on the phone and over the internet as well as the video exchanges gave me the complete package to be able to train, handle and sell arson dogs that are fully competent and capable of certification. At this time, my dog “MO” is working in the East Moline Fire Department and for surrounding communities. Wayne,Just thought I’d drop you a quick note and let you know that “Cole” has now been proven in the field for his first arson search. 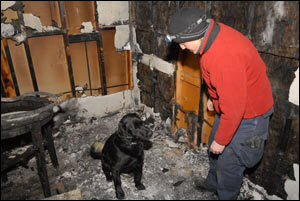 Lab results confirmed what his nose found and we have worked three arson fires to date! I’ve attached a photo of him and I in action. This fire was 5 weeks old and in -20 degrees by the time we got on scene and he had no problems indicating. Curious about the online approach for this program? The canine selection process was tough, to say the least, and Wayne was there every bit of the way reaffirming the right canine would come along and make all the efforts worthwhile. Ultimately, in the end, I could not have been more satisfied with the program, direction, and guidance of Wayne, as is my agency. Trust him, his input and direction, you too will be pleased. This program is designed to teach you to enter the Arson Detector Dog business either as a handler or as a trainer. It is also perfect for any Fire or Law Enforcement department who wants to train their own dog or have an in-house arson dog trainer. The program will be taught through lecture, video presentation, and instruction with our highly qualified instructors. Your trainer will actually be with you during 2 of your daily training sessions using the power of the internet. In the six week program, you will learn how to train an arson dog. We also have a section on business, where we teach you to start your own business selling arson dogs or starting an arson detection search service. Students will be required to demonstrate basic training and handling skills with their dog. There is a practical and verbal exam to complete this course. This is a six week program. You need an internet ready computer and a phone. You will train daily with your dog and attend 1 online seminar a week. We will also attend 2 – 3 of your daily training sessions each week using the power of the internet.